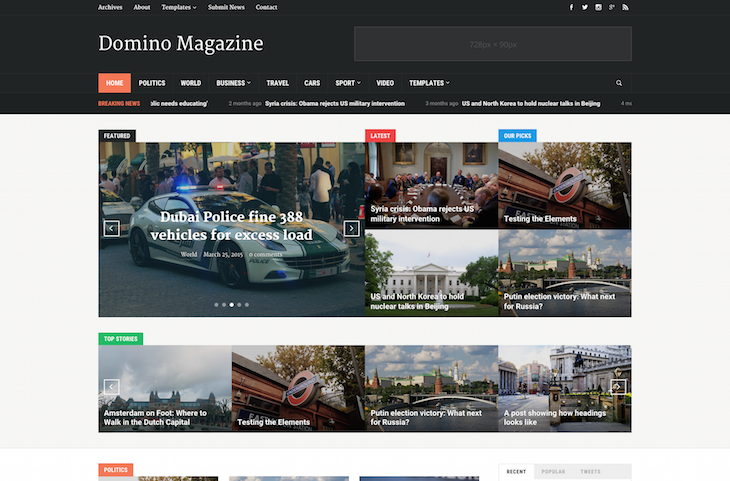 WPZOOM is proud to present our first WordPress Theme – Yamidoo Magazine. 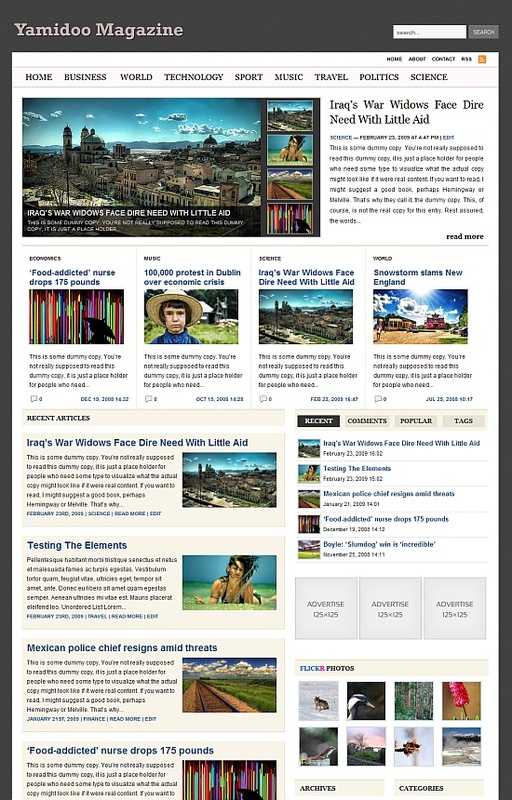 Yamidoo Magazine is a Magazine-Style Premium Theme created for any type of informative websites such as a complex News Portal, or simply informative blog. 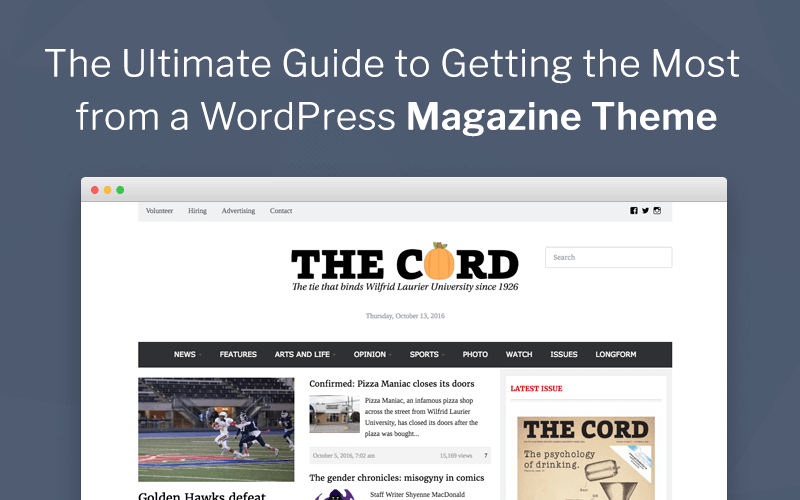 With a simple layout, this theme can be easily adapted to create a perfect look of your blog, whatever how advanced are your skills in web-design. Yamidoo Magazine has a very well organized structure, that allows your readers to be focused on the most important of your content. Cross-Browser Compatible – tested on IE (6,7), Opera, Firefox, Safari, Chrome. What’s in the box when you buy Yamidoo Magazine? Needed plugins to give more functionality to the theme. 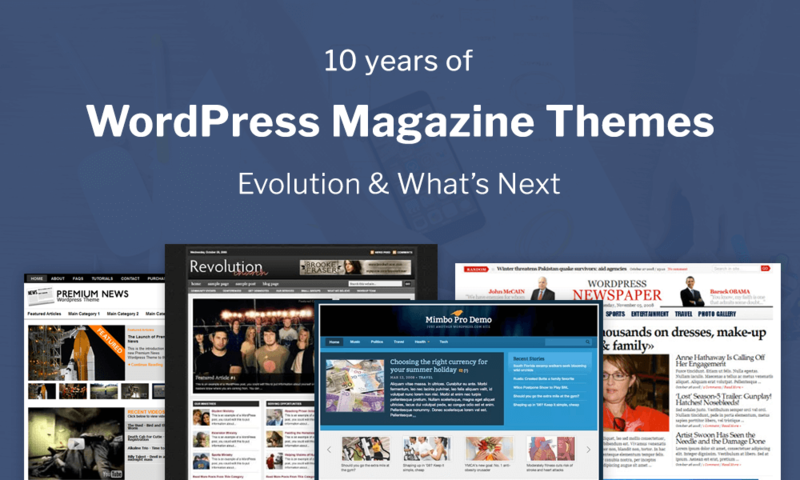 You can join our Affiliate Program and promote Yamidoo Magazine WordPress Theme via your website. All you need to do, is sign up for our affiliate program through E-Junkie. 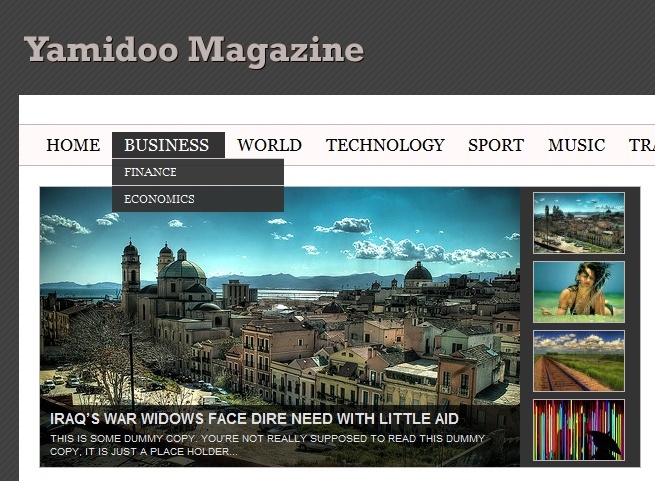 Once you have signed up, you can start selling Yamidoo Magazine WordPress Theme immediately. You will receive 25% commission on all the sales generated through your website. These commissions will be paid within 7 days of the end of the month and all payments will be made via PayPal only. This is a great looking theme. Does the theme support WP 2.7 threaded comments? Is the related posts functionality built into the theme or is that a widget? How does the featured content box work? 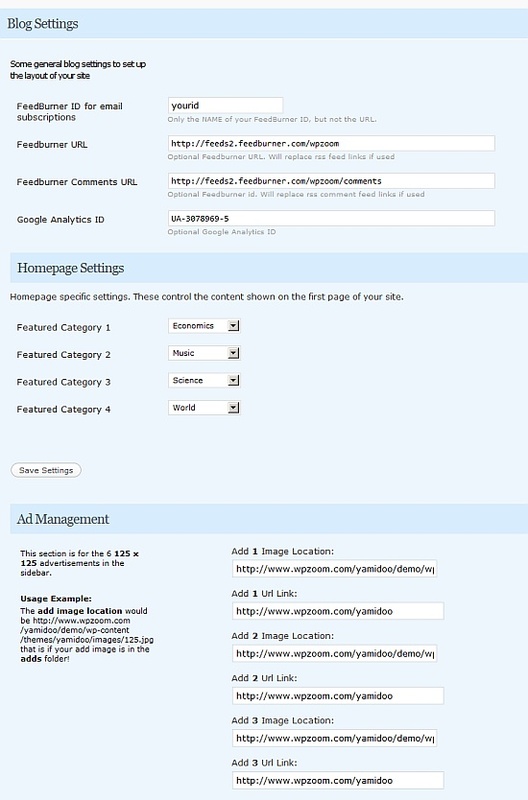 Does it pull the latest posts or can you specify what is featured – such as particular products? Thanks. Also, once I have bought the theme, do I automatically get updated versions as they are released? Yes, related posts is a built-in widget. Featured content box automatically pulls in your latest posts, but using stick options, you can decide which of the posts to show. I’m working right now on implementing threaded comments for 2.7, and it will be added in the next update. Any updates will be automatically given to customers. can a leaderboard ad cell be added to the website to replace the search option? @randy I can make a customization like this for you. I just purchased this theme and I would also like to know how I can replace the search bar at the top with a 468×60 ad.. can you help? Is the script supported on WPMU? I want to use it as my main website then different themes for subdomains. Apparently, timthumb script is not working well for WPMU, right? Please email me at jed@deafnation.com to go further with the support that I need to resolve some issues with this theme. Looking forward to get it in public! Is this site adsense ready? If not, is it easy to incorporate adsense in it? Best I’ve seen so far, but why no forum where members can share ideas once they’ve purchased the theme? I bought the theme and would like a little bit of help tweaking it. No major changes, just getting what I’ve done with the .psd to theme files. considering buying this theme, but surprised there is no support forum, that would clinch the deal for me, where i can talk to others with the same theme and how to tweak things.. etc..
@Alicia, you have to configure flick-rss plugin with your id, to get the images you want to show. Just go to Settings -> flickRSS an fill required fields. I purchased it and no problems so far. 1. 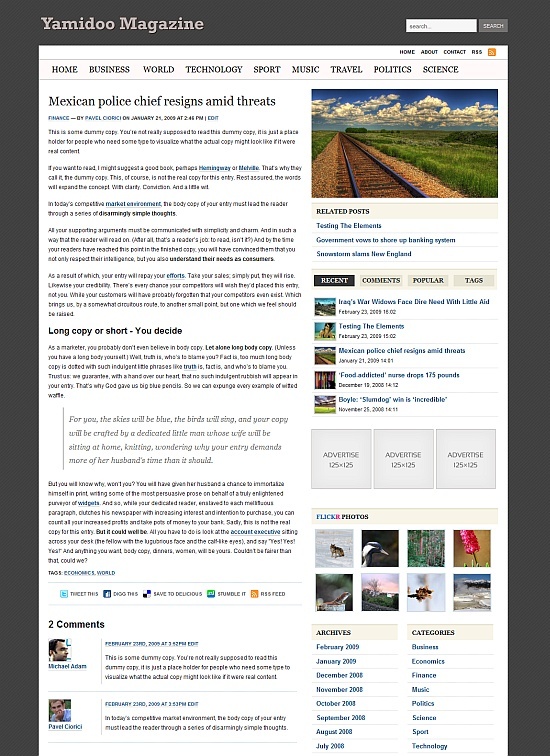 I want the tabbed widgets section to pull articles from a category named “Bloggers”. I don’t want this category to appear anywhere else except in the tabbed widgets box. 4. I want a banner ad at top and a 125 x 600 ad in the side bar. 3.I want to restrict which posts appear in the Feature section. 5. I want to know if you’re going to upgrade to Post Thumb Revisited. Great Theme. Keep up the good work. I do have a question regarding the copyright statement in the footer. If I purchase a license, am I allowed to remove the links and/or what are the restrictions on making the theme represent my product/site only? @RDWatkinsz, actually only if you buy Developer’s License you will be able remove footer notice, but if you think this is to expensive for you, contact me via email and we will figure that out. Just a question, Can I remove all copyrights if I buy a single license? There are so many free themes around so a paid theme must be exceptionally good to sell well. Yamidoo Magazine is one of the high quality themes that definitely worth buying! @mark, you are allowed only for an extra payment. use please contact form if you are interested in this. thank you for your complete answer by mail. very pro of you. How do i turn OFF flickr photo display but NOT turn off the footer? I don’t need the flickr display. Go into the sidebar template and remove the flickr code. And when is this guy going to get a forum? It takes about 15 minutes to set one up. Is there a way to get the featured content box area to only show postings from one category? I tried modified the query post function for this in the index.php file and it worked, but when I did it, the preview photos are matching the proper posts. So is there an easy way you know of that can do this? oops, I’ll post in the forum. i like yamidoo but i need 468 banner on top of page also some other places to earn some money. please do it as it will help buyer to make some money from the blog. I have checked it again and say that it should also have built in photo gallery and video gallery which is very important if you are running a news paper or magazine. i hope you check emails and implement above ads and galleries. I purchased your theme recently and I am loving it. I’m getting around to customizing it and ran into a little problem. I added an image to a post and it shows up fine in all sizes on the main page (http://one5seven.com/blog/) but when I click on the post to “read more” the image that should be in the sidebar (http://one5seven.com/blog/?p=59), isn’t there. How can I fix this? Superb theme, very very elegant and full-featured! I´m wondering how can I add an extra logo with a link to another website, at the right side, next to the search button in the header???? if here any offers yet, if is please can you let me know please. WOW, have just stumbled across your site from a blog based in the Phillipines..lol..
Was following the comments and am very interrested in your reply to a question regarding adsense. Lovely theme. Very Professional. Check my review soon! I am interested in this site for my mag…but some quick layout/design questions: can the picture preview be designed in flash? and can the preview be on more than one page? Also can the title header be an image? I’ll bet you a dime to a doughnut it’s that url you have in the css.